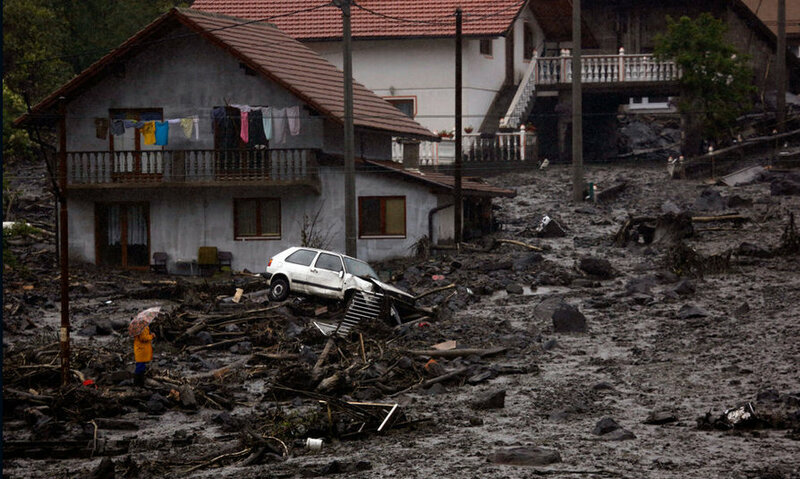 Important floods occurred in Central and Southeast Europe in middle May 2014, affecting four countries (Serbia, Bosnia and Herzegovina, Croatia and Romania) and causing at least 62 fatalities and more than one billion euros damages (StiriTV). Over 2000 landslides were induced by the floods across the Balkan area (Independent). Serbia was the most affected region follow-up by Bosnia and Herzegovina (respectively 33 [b92] and 24 fatalities [AlJazeera]). Those events are the heaviest rains and floods recorded in the past 120 years in these two countries, with more than 105 mm daily rain recorded in several major towns like Belgrad (Independent). One of the main concerns of the authorities after the floods peak is that it remains more than 100’000 land mines across Bosnia and Herzegovin from the Bosnian War (1992-1995). Many of those have been dislodged by the extreme rains, floods and landslides and are now out of control (Independent, Reuters and AlJazeera) . 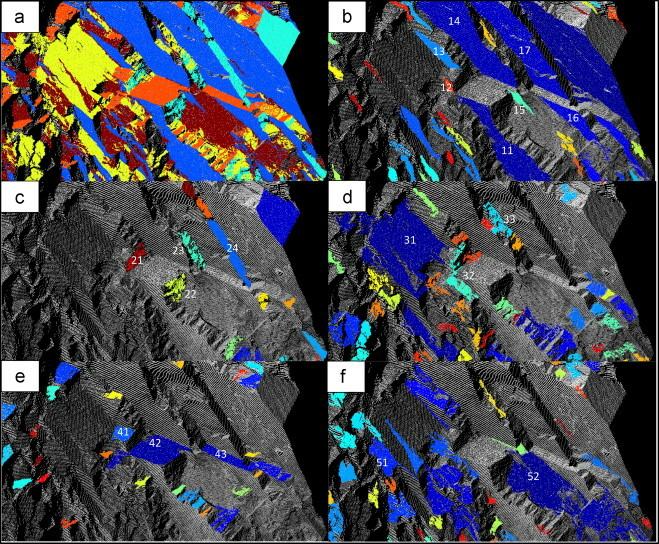 In this paper we present a semi-authomatic methodology for the identification and analysis of flat surfaces outcropping in rocky slopes from 3D point clouds. The method is based on a three steps process: (i) to carry out a nearest neighbour points coplanarity test and to computate the normal vector; (ii) to find the principal orientation families by Kernel Density Estimation; and (iii) to identify and extract clusters of points belonging to the same discontinuity. Different sources of information – synthetic and 3D scanned data – were employed in this study, being raw source files and obtained results freely provided aiming to a more reproducible research. Example of clusters identification. (a) One colour per discontinuity set with all clusters labelled; from (b) to (f) family sets representation using one colour per cluster (Riquelme et al., 2014). 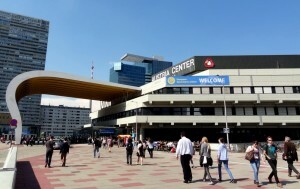 Almost the entire group Risk participated to the European Geosciences Union General Assembly in Vienna, Austria, on 28 April to 2 May 2014. This huge meeting brought together over 12’000 scientists from over 100 countries. 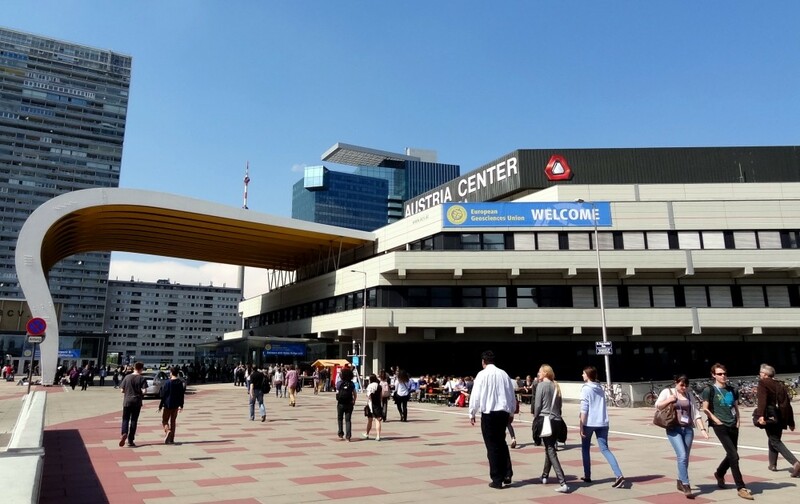 This is the world biggest meeting for natural hazards sciences. It is always an excellent opportunity for our group to meet new people and other scientists we work with for a long time. The Group Risk presented 28 posters and 4 orals in the Natural Hazards division (titles listed below). 3D granular deposits on rock avalanches: can the application of different operators and filtering techniques improve our understanding of the phenomena? Coupling high resolution 3D point clouds from terrestrial LiDAR with high precision displacement time series from GB-InSAR to understand landslide kinematic: example of the La Perraire instability, Swiss Alps. Risk along a road from rheological data: application on Pont Bourquin landslide. Some aspects of risks and natural hazards in the rainfall variability space of Rwanda.